Propane is a naturally occurring gas composed of three carbon atoms and eight hydrogen atoms. It is created along with a variety of other hydrocarbons (such as crude oil, butane, and gasoline) by the decomposition and reaction of organic matter over long periods of time. After it is released from oil fields deep within Earth, propane is separated from other petrochemicals and refined for commercial use. Propane belongs to a class of materials known as liquefied petroleum gases (LPGs), which are known for their ability to be converted to liquid under relatively low pressures. As a liquid, propane is 270 times more compact than it is as a gas, which allows it to be easily transported and stored as a liquid until ready for use. Approximately 15 billion gal (57 billion L) of propane are consumed annually in the United States as a fuel gas. The greatest consumers are the chemical and manufacturing industries, which use propane as chemical intermediates and aerosol propellants, followed by residential homes and commercial establishments, who use propane for heating and in dryers and portable grills. The value of petroleum products has long been recognized by the civilized world, with documented examples of their use stretching back more than 5,000 years. The ancient Mesopotamians used petroleum-derived tar-like compounds for many applications, including caulking for masonry and bricks and adhesives for jewelry. About 2,000 years ago Arabian scientists learned one of the basic tenets of petroleum chemistry—that it can be distilled or separated into different parts, or fractions, based on their boiling points, and that each fraction has its own distinctive properties. The modern era of refining is considered to have begun in 1859, when petroleum was found in Pennsylvania and the Sennaca Oil Company drilled the first oil well there. From a depth of 70 ft (21.2 m) the world's first oil well produced nearly 300 tons (305 metric tons) of oil in its first year, and thus an entire industry was born. Propane was first recognized as an important component of petroleum in 1910, when a Pittsburgh motor car owner asked chemist Dr. Walter Snelling why the gallon of gasoline he had purchased was half gone by the time he got home. The car owner thought the government should investigate why consumers were being cheated, because the gasoline was evaporating at a rapid and expensive rate. Snelling discovered a large part of liquid gasoline was actually composed of propane, butane, and other hydrocarbons. Using coils from an old hot water heater and other miscellaneous pieces of laboratory equipment, Snelling built a still that could separate the gasoline into its liquid and gaseous components. Since the days of Snelling, chemists have made tremendous advances in techniques for processing propane and other LPGs. Today, the manufacture of propane gas is an $8 billion industry in the United States. which accumulate in subterranean reservoirs made of porous layers of sandstone and carbonate rock. Petroleum is derived from various living organisms buried with sediments of early geological eras. The organisms were trapped between rock layers without oxygen and could not break down, or oxidize, completely. Instead, over tens of millions of years, the residual organic material was converted to propane-rich petroleum via two primary processes, diagenesis and catagenesis. Diagenesis occurs below 122°F (50°C) when the organic "soup" undergoes microbial action (and some chemical reactions) which result in dehydration, condensation, cyclization, and polymerization. Catagenesis, on the other hand, occurs under high temperatures of 122-424°F (50-200°C) and causes the organic materials to react via thermocatalytic cracking, decarboxylation, and hydrogen disproportionation. These complex reactions form petroleum in the sedimentary rocks. Propane manufacture involves separation and collection of the gas from its petroleum sources. Propane and other LPGs are isolated from petrochemical mixtures in one of two ways—by separation from the natural gas phase of petroleum and by refinement of crude oil. Both processes begin when underground oil fields are tapped by drilling oil wells. The gas/oil hydrocarbon mixture is piped out of the well and into a gas trap, which separates the stream into crude oil and "wet" gas, which contains natural gasoline, liquefied petroleum gases, and natural gas. 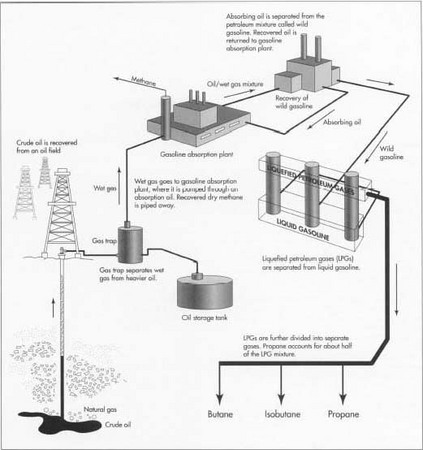 The "wet" gas comes off the top of the trap and is piped to a gasoline absorption plant, where it is cooled and pumped through an absorption oil to remove the natural gasoline and liquefied petroleum gases. The remaining dry gas, about 90% methane, comes off the top of the trap and is piped to towns and cities for distribution by gas utility companies. The absorbing oil, saturated with hydrocarbons, is piped to a still where the hydrocarbons are boiled off. This petroleum mixture is known as "wild gasoline." The clean absorbing oil is then returned to the absorber, where it repeats the process. The "wild gasoline" is pumped to stabilizer towers, where the natural liquid gasoline is removed from the bottom and a mixture of liquefied petroleum gases is drawn off the top. This mixture of LP gases, which is about 10% of total gas mixture, can be used as a mixture or further separated into its three parts—butane, isobutane, and propane (about 5% of the total gas mixture). As described above, propane must be carefully isolated from a complex mixture of petrochemicals which includes methane, ethane, ethene, propene, isobutane, isobutene, butadiene, pentane, and pentene, to name a few. If such impurities are not removed, the propane or propane and butane mixture will not liquefy properly. Liquefaction at appropriate temperature and pressure is critical for the gas to be economically useful. The liquefied gas industry has established standardized specifications that LPG mixtures must conform to in order to be considered acceptable for use as fuel gas. Standardized test methodologies for evaluating these specifications are approved and published by the American Society for Testing and Materials (ASTM). For example, the LPG known as "commercial propane" must have a maximum vapor pressure of 200 psig at 100°F (38°C) and can have no more than 0.0017 ounces (0.05 ml) of residual matter. Furthermore, the allowed amount of volatile residue is strictly limited, and the gas must meet established guidelines for corrosivity to copper, volatile sulfur content, and moisture. Other mixtures of propane and butane are commercially available which have slightly different target values. These tightly held quality standards make propane an environmentally attractive fuel. In fact, to meet pipeline standards, nearly all pollutants are removed from propane before it is allowed to enter pipelines. When used in properly adjusted and maintained burners, propane's emissions easily meet the standards for clean air set by the Environmental Protection Agency (EPA). Their testing has proven that propane is environmentally safer than other hydrocarbon energy sources, and that properly processed propane can be used as a motor fuel which is significantly cleaner than gasoline. Studies have shown that, compared to gasoline, propane engines have as much as 45% less ozone-forming potential. Results of another recent EPA study show propane reduces total hydrocarbon emissions by 29% according to the new Federal Clean Air Standards. Furthermore, carbon monoxide emissions are 93% below the standard, hydrocarbon emissions are 73% below the standard, and nitrogen oxide emissions are 57% below the standard. As detailed above, the manufacture of propane produces a variety of byproducts that are economically useful. Actually, it is more accurate to think of these not as byproducts but as co-products, since they are produced along with propane as part of petroleum refinement. These co-products may be in the form of solids, gases, or liquids. Solids (or semisolids) include bitumes, hydrogen sulfide, and carbon dioxide and are sold for fuel purposes. The liquid fractions include crude oil, which is further refined to give a variety of products. These oils vary dramatically in appearance and physical properties like boiling point, density, odor, and viscosity. The different fractions of crude oil are referred to as "light" or "heavy" depending on their density. Light crude is rich in low-boiling and paraffinic hydrocarbons; heavy crudes are higher-boiling and more viscous. They yield a variety of asphalt-like molecules. Many of the co-products of propane production, such as propylene and butylene, are useful in gasoline refining, synthetic rubber manufacture, and the production of petrochemicals. As the field of petroleum chemistry evolves, propane chemistry will continue to advance. Improvements will be made in the way propane is separated from petroleum. One area that offers opportunity for advancement is in the area of oil well production. Much natural gas is burned at remote oil wells because the extensive piping system required to transport it is prohibitively expensive. There are efforts underway to convert more of this wasted gas to condensable gases, which could be easily stored and transported. It is also important to note that propane is likely to become increasingly popular as a fuel gas based on economic factors and enviromnental concerns. In fact, in the Clean Air Act of 1990 Congress named LPGs as one of the clean-burning alternative fuels designated to take national air quality into the twenty-first century. Clark, William, ed. Handbook of Butane! Propane Gases. Butane-Propane News, Inc., 1972. National Propane Gas Association. http://www.propanegas.com/npga/ (July 14,1997). I was thinking about heating my home with LGP. At present I heat with oil. My supply Co delivers both. The oil is about 2.90/gal and using a 500 gal LPG tank it would be $1.98/gal. That sounds good now and the cost of oil will go up to ? Would LP be going up also with vehicles using it? is avialable in my contry.